December 16, 2015 –While Canadians have become lamentably accustomed to seeing hockey stars such as Sidney Crosby, Paul Kariya and Chris Pronger suffer the effects of career-altering or ending head injuries, a new poll from the Angus Reid Institute shows damage from concussions hits even closer to home for average Canadians – one-in-five of whom say they’ve experienced such a brain injury while playing sports as a child or adult. This comprehensive study of Canadian adults also indicates a higher level of reporting and treatment of concussions now than in the past – and significant support for regulations aimed at monitoring and preventing such injuries among young people. Given this definition, respondents were asked to indicate whether, while playing sports, they had sustained one or more concussions, or whether they had sustained an injury that they believe was a concussion but was not diagnosed as such. As mentioned earlier, among those who say they had a suspected concussion playing youth sports, fully half say it was never formally diagnosed. This finding correlates to the vast underreporting of concussions that will be discussed later in this report. For the purposes of this report, ARI focuses on incidences of concussion in youth sports, which – as noted – account for the vast majority of concussions respondents experienced on the playing field. This ARI data also shows men report suffering concussions playing youth sports by a three-to-one margin over women (24% versus 9%), as seen in the graph that follows. This disparity can largely be attributed to higher rates of participation in sports among men. The higher prevalence of concussions among men is in line with a 2013 report by the BC Injury Research and Prevention Unit, which found that men account for an estimated 60 – 70 per cent of concussions among the total population. Notably, while men do experience higher levels of concussions on aggregate, when compared to women competing in the same sports – ice hockey, basketball and soccer – concussion rates among female athletes are actually much higher than their male counterparts. Symptoms and Effects – what happened to those who got hit in their youth? A brain injury with easily more than a dozen physical symptoms, concussion is also known for its cognitive, psychological and emotional effects on those who suffer from this blow to the head. Asked about the duration of their symptoms, most (51%) say they dissipated within a period of hours to a day or so. For a smaller group (39%), the effects were longer lasting (see graph on the following page). 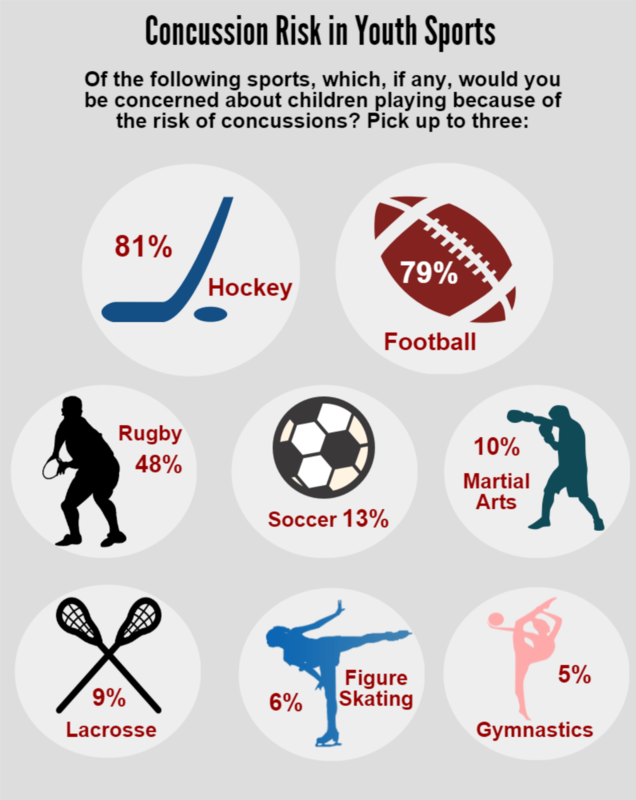 More than one-in-five (22%) parents with children in organized sports say their child has had a concussion or suspected concussion while playing. This includes both parents whose children currently play youth sports and those whose children used to play sports and are either adults now, or are still under 18 but no longer playing. Comparing parents’ experiences with their children’s concussions to adults’ memories of their own childhood concussions, an interesting pattern emerges: Parents are more likely to say their children’s symptoms lasted for a month or more, while adults thinking about their own injuries in youth are more likely to say their symptoms lasted only a short time. There are a few possible explanations for this discrepancy: it could be a product of parents’ more recent experience with their children, the fact that parents are likely to be alive to their children’s serious injuries (and, as we’ll see below, many of those who had a childhood sports concussion said no adult was aware of theirs), or perhaps of increasing awareness of concussions and their symptoms. In many sports, athletes have traditionally been celebrated for playing through injuries – including blows to the head. Even today, some players and coaches talk about athletes “getting their bell rung”, and the admonition to “shake it off” and keep playing. In part as a result of this persistent culture, a true reflection of the frequency of concussions in youth sports has been difficult to attain. In fact, one study found that fewer than half (47%) of American high-school football players who said they had sustained a concussion during the season had actually reported it to someone. This reluctance to report was on display in Canada in 2013 with the tragic death of Ontario teenager Rowan Stringer, a 17-year-old female rugby player who died after suffering multiple concussions in less than a week. She communicated her suspicion that she may have a concussion via text with a friend but ultimately did not see a doctor. There were no legal requirements for how her case should have been handled after she sustained the first impact. The results of this ARI study provide additional evidence of this lack of reporting, but suggest that Canadians are becoming more likely to take a potential concussion seriously. Research suggests that concussions in young athletes are of particular concern because of children’s still-developing brains and bodies, which do not absorb traumatic impacts as well as adult bodies do and take longer to recover from such trauma. Physicians have also suggested that young athletes are more at risk of long-term effects of head injuries than older athletes. Further, when it comes to adequate effort to prevent or mitigate concussions and their effects, there appears to be a perception amongst Canadians that young athletes are facing more health risks than necessary. Opinions are similar when asked about youth leagues operating outside of school: just under half (47%) say they are unsure about policies in these leagues, while 37 per cent say a good plan exists. Notably, Saskatchewan has the highest level of agreement in the country when looking at its leagues (see comprehensive tables at angusreid.org). In fact, the Saskatchewan Soccer Association received national attention last year for its comprehensive concussion policy, while the Saskatchewan Hockey Association has implemented return-to-play policy. Does government have a role to play? In response to the tragic case of Rowan Stringer, Ontario is now considering adopting “Rowan’s Law”, which would be the first concussion-related legislation in Canada. Rowan’s Law, like the Zachary Lystedt Law in the U.S., would add mandatory protocols and education to youth sports. Return-to-learn and return-to-play protocols for youth athletes with concussions. Requiring medical clearance of concussed athletes before they return to play. Concussion education for young athletes, parents and coaches. Parents of athletes’ support for government regulation is virtually identical regardless of whether their child has had a concussion playing sports (66% support) or not (68% support). On the issue of requiring a health professional to be present for all organized youth games, a follow-up question asked respondents about costs. The Angus Reid Institute also put a more stringent option to respondents: banning contact sports for children under 14. On this, the majority (57%) are firmly opposed, with the highest level of disagreement coming from young women, nearly two-thirds (63%) of whom are against this idea. Opposition is also this high (63%) among Canadians who played youth sports themselves. For all the attention concussions in sports have been receiving – and for all the concerns respondents voice about them in this survey – it should be noted that more than two-thirds (67%) of Canadians say that the benefits of sports “far outweigh” the risks of concussions and associated long term health effects. On this statement, younger women are most likely to “strongly agree” (36% do so), while older Canadians (those aged 55 or older) – both women and men – are most likely to “strongly disagree,” though just 14 per cent in each group do so (see comprehensive tables at angusreid.org). Notably, parents who have had a child deal with a concussion are no less likely to agree that the benefits outweigh the risk of sports participation. 70 per cent of parents who have had this experience agree, compared to 69 per cent of parents whose children have not dealt with such an injury.